GHH.com is NOT for sale. 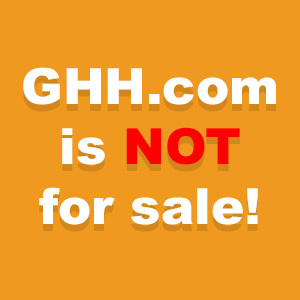 The domain GHH.com is not for sale, yet someone who claims to be the owner is seeking a broker to sell it on their behalf. Valuable three letter domains can fetch a high premium for brokers; using a third party to broker a domain that belongs to someone else can get domain brokers in very hot water. We were contacted by Paul Haughney of Maven Domains, who received an inquiry to broker GHH.com. Eventually, the real owner of GHH.com, Mr. Gerard Hughes, contacted Paul, and stated that his email had been compromised. GHH.com has never been up for sale. GHH.com is in the possession of the legitimate owner, and it has not been stolen – what has been compromised is the associated email address. As it’s an AOL account, we’re assuming that the information was part of the massive leak of email passwords made public during the past 18 months, involving AOL, Hotmail, and Yahoo emails. Subject: Re: GHH.com domain name. GHH.COM is not, and has never been legitimately for sale. Don’t trust faxes or emails of government ID as proof unless you have ways of verifying that such ID is a true and correct copy of valid ID. This email account was hacked recently and I have only recently recovered it. Do not let the seller trick you into using Skype or other communication channel. The hacker has attempted to fraudulently sell GHH.COM, potentially defrauding potential buyers of of large sums of money. Please be aware that any offers to sell GHH.COM to you are fraudulent. If you receive any offers to sell you my domain, GHH.COM, please forward to them to this address so I may forward them to law enforcement. And may also use “adomainholder@outlook.com” – or any email, for that matter. He (she?) is a hacker after all. The hacker appears to be trying to take control of this account again. So even if “I” contact you from this email offering to sell the domain to you, please, please use an escrow service that requires participants to prove their identity beyond having control of an email account. Also, the hacker seems to have an aversion to talking directly on the phone. So, if you are wondering if a contact is me, look me up in the “white pages” on line. My phone number in Alameda is listed. It is harder to steal a long-time listed land line than to steal an email account. On that note, if you still manage domain names with AOL, Yahoo or Hotmail accounts, change to a more secure email provider that supports two factor authentication! Thanks for boosting the signal on this ongoing cat and mouse game with the hacker trying to sell my personal web and email domain out from under me. I registered ghh.com back when unpronounceable 3 letter domains were still plentiful. It’s my initials, so I’ve never had any plans to sell it. I’ve learned a number of security lessons from this, one of which is that domain registrars presume to a fault that control of an email account is proof of identity and ownership of a domain. So locking down your ICANN registered email is critical. The other thing I learned is that if you have a valuable domain, your registrar should offer account change notifications and 2 factor authentication. Any registrar that does not offer those features is, IMO, negligent.